The Chinese Cabbage seed I grew is F1 One Kilo SB Seeds, I forgot to mention this when I first posted my question. Lucky you,if you leave it in, the flower will go to seed - and hey presto - you won't have to buy seed for next year. Though I have just noticed it's an FI , these don't come true to parent plant, but you may have an interesting mix of the individual parent plants used to make the F1 variety. 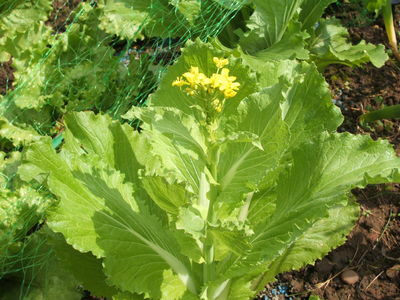 If I remove the flower will the cabbage still grow to normal chinese cabbage or do I have to harvest it now before the seed sets? Hi Sodapopkic, I think it has definitely bolted and wants to seed even if you cut the flower it won't revert back. I had a feeling that you might have better luck from a late planting, apparently they do better from an early or a late planting. long days make them bolt, they are a cool season plant, but extreme cold at night can also make them bolt.So if you have seed left you could try again. Thanx for replying, do you think I can cook the leaves that have grown before throwing the rest of the plant away? Well the leaves look fine don't see why not! The Michilini Cabbage grows better if you start in early autum, if you start it during spring or late winter, it will probably grow quickly to seeds. Wait for those seeds to bloom and you can use them for next early autum.